This piece was created as a wedding gift for my brother-in-law and his bride. What do you always give at a wedding? Kitchen appliances, home decoration or crystal bowls? Why not make it a very personal gift? 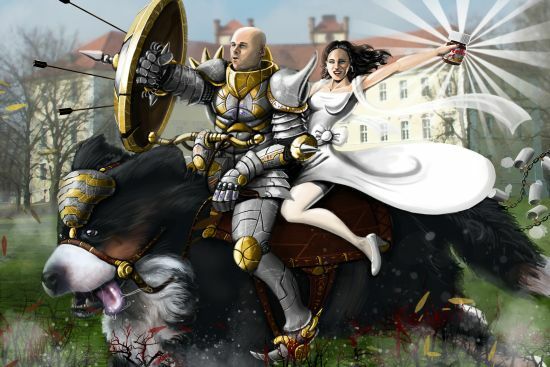 In the painting they are both riding on their dog while he is dressed as a knight in armour protecting her Nutella. She loves Nutella with a passion and I wanted to make sure that was included in the artwork. The dog is a Berner Sennen and is huge. He needed to be in it in some way. They received it as a big poster in a frame at the party after the wedding and absolutely loved it. We made smaller ones for the parents too.